Condor is well suited to running large numbers of R jobs at the same time (i.e. concurrently). If the application applies the same kind of analysis to large data sets (so-called "embarrassingly parallel" applications) then Condor can significantly reduce the time needed to generate the results by processing the data in parallel on different PCs. In some cases, simulations and analyses that would have taken months on a single PC can be completed in a matter of days. 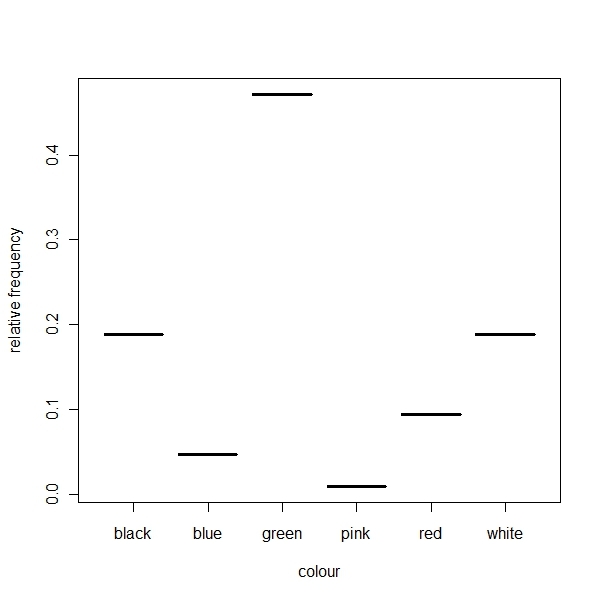 The problem is to combine this data in order to calculate the relative frequency of each car colour. We'll create three R scripts to carry out each of these tasks in turn namely: initalise.R, analyse.R and collect.R respectively. Each of these is described below. This is the file initialise.R. This is the file analyse.R. Note that the filenames do not need to include an index value - this will automatically be taken care of by the simplified Condor job submission process. The script can easily be tested on a PC by copying one of the input files to observations.dat and running the script via the R graphical interface. It should produce results.dat. It is always a good idea to test scripts first locally to check that they work (even if only minor changes have been made) as it can be difficult to diagnose errors later under Condor. There is one fairly subtle point here which is worth making. By using R's high level built-in functions, it is not necessary to know the how much data is stored in each input file. Thus each input file could contain a different number of observations (possibly with "NA" values) and this will be handled transparently. Building this kind of flexibility in early on is always a better idea than trying to adapt a more complicated script later. This is the file collect.R. The script simply loops over each output file and sums the absolute frequencies for each category before calculating the overall relative frequencies. This script can be run on a desktop PC once all of the output files have been downloaded from the Condor server. The R script to be run on the Condor pool is specified in the R_script attribute. Note that under UNIX, filenames are case sensitive so that the script name needs an upper case R. Another UNIX hazard that may trip up users more familiar with Windows is that spaces should not be used in filenames. If you have files which have spaces in their names, the spaces are best converted to either the underscore ('_') or hyphen ('-') character before uploading them to the Condor server. The input data files are given in the indexed_input_files attribute. Multiple sets of input files should be provided as a comma-separated list e.g. The index values do not need to be included as the simplified job submission process will take care of this for you. If there are input files which are common to all jobs then these can be specified using the input_files attribute. This is useful if the common input files are relatively large. Where there are multiple R scripts needed by the application, those that are called from main R script (given in R_script) can be included in the list of common input files in input_files. Those output files which jobs are expected to produce are listed in indexed_output_files in a similar way to the indexed input files. The indexed_log attribute is optional but can be useful in tracking the progress of jobs as well as diagnosing problems and its use is recommended. 10 job(s) submitted to cluster 657. Where <your_unix_username> is the username that you logged in with. Initially the Condor jobs will remain in the idle state until PCs become available: e.g. The state is shown in the ST column and I indicates an idle job. As some of the jobs start to run the state will change to run, denoted by a R e.g. (it will not be possible to plot the results unless you are running a graphical interface such as eXceed). The files can also be downloaded to a PC and processed there. There will also be ten log files (logfile*) which are not of any great interest but can be useful in tracking down problems when things have gone wrong and are also useful in finding out when and where each job ran and for how long. This is of course a very simple example and the overall execution time is likely to be dominated by the time taken to read the input data and write the output data to/from disk (disk access is on the order of a million times slower than CPU speed). If you look at the log files you will see that the actual run time was only on the order of a few seconds e.g. 005 (659.000.000) 10/30 11:51:27 Job terminated. Here the job used just two seconds of CPU time (Total Remote Usage). Although the example application presented here is a very artificial one, the overall method can be used to tackle more realistic problems having significant computing requirements. The input data may be composed of a large multi-variate data frame(s) which will first need to be divided up in some way so that the data can be processed in parallel using the Condor pool. The analysis of the data may also be far more complicated leading to much longer job run times. For many problems, it is possible to divide the input data into an arbitrary number of parts to the reduce the individual job run times. As a rule of thumb, Condor works best with run times of around 15-30 minutes.